More on Zivadinov`s press conference in the National Post. Preying on desperate people by recommending an expensive test with no proven utility is contrary to the Hippocratic Oath. Zivadinov should only be performing his occult art as part of a project funded by peer-reviewed research grants, if he can get one. Dr. Paul O’Connor, a neurologist at Toronto’s St. Michael’s Hospital, said he would advise against patients even getting tested. Both he and Dr. Freedman also suggested that Dr. Ziadinov may be in a conflict of interest, given that his Buffalo Neuroimaging Analysis Center is now offering neck scans to MS patients for fees of $4,500 to $6,000. Due to the proliferation of “CCSVI” (more than 300,00 hits on Google) since CTVGlobemedia ignited the firestorm of junk science I am forced to add a new blog to reply to the latest outbreaks of hysteria. Our earlier blog comments in general on Zamboni’s fantasy and events before today. 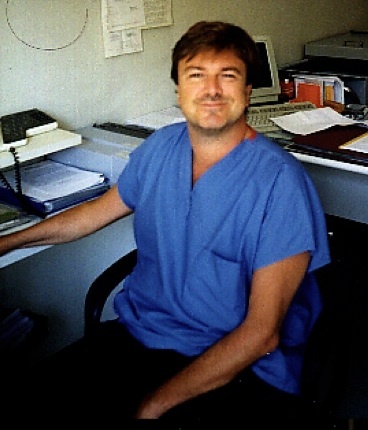 True believers of “CCSVI” had been blogging excitedly about a press conference by a Dr. Zivadinov at the University of Buffalo who somehow managed to fund a Doppler ultrasound study of the neck veins of MS patients and normal volunteers. He may have received funding from Fondazione Hilarescere, a foundation run by Zamboni that doles out money to himself and his friends. 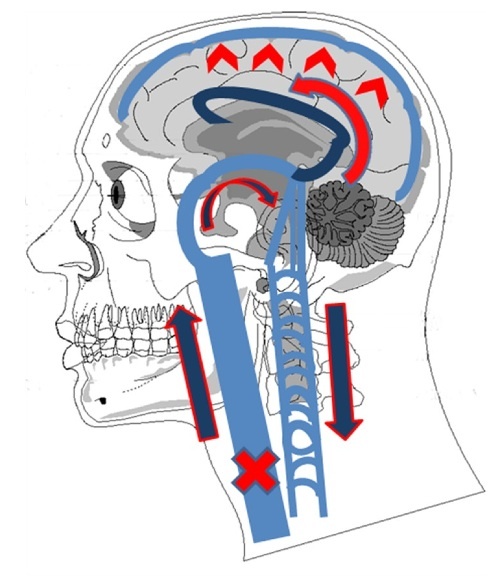 A diagram of "abnormal" venous flows in the head as imagined by Dr. Marian Simka, a Polish acolyte of Dr. Zamboni. Zivadinov was looking for such patterns in his "CTEVD" study. 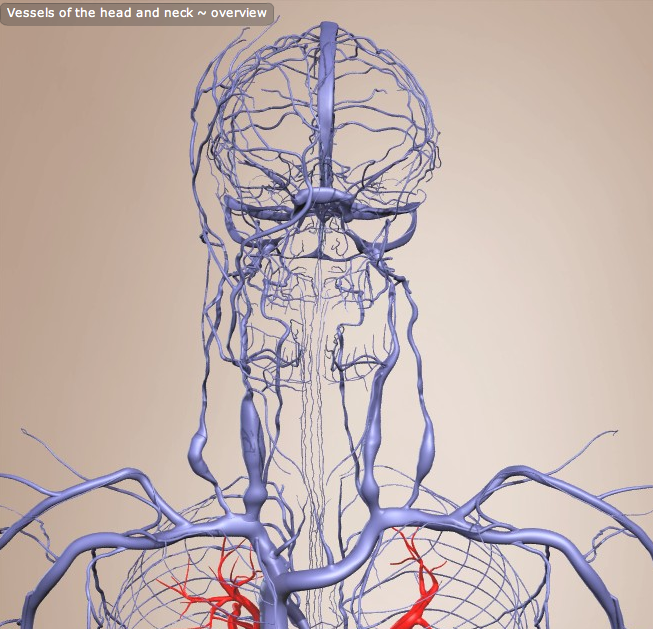 We guess that those red arrows pointing up imply blood is pushing against the brain causing MS. Blockage of an internal jugular vein does not raise intracranial pressure and, therefore, cannot cause damage to the brain. 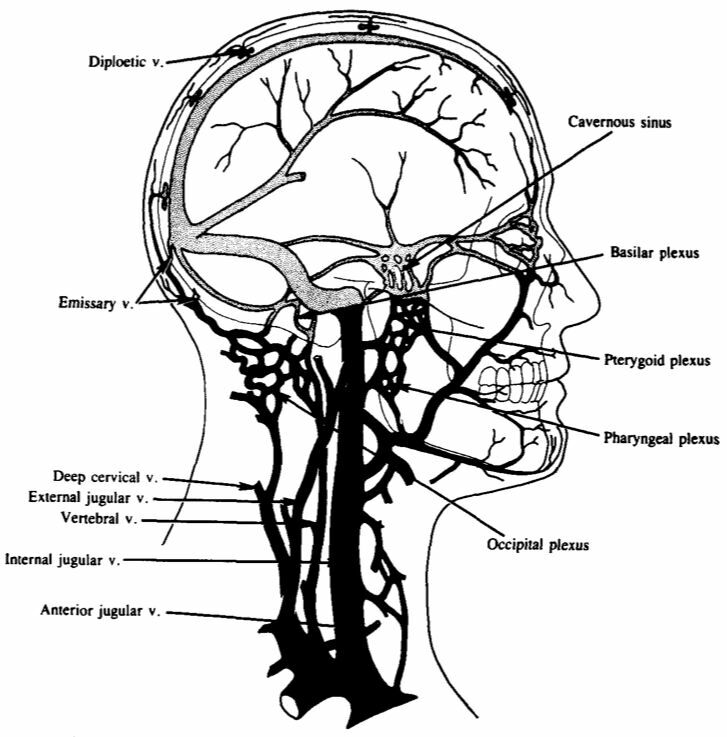 The paraevertebral venous plexus can handle venous drainage from the brain. At any rate, here we have an example of science by press conference, a sure sign of junk science. Real scientists do not talk to the press until their work has been exhaustively reviewed by peers and published in a respectable journal. One really can’t comment on the details of this “study” until the techniques and results are published, if ever. However, a few general observations can be made. Even if Zivadinov is putting his results in the best light, the study exposes the surreality of “CCSVI”. 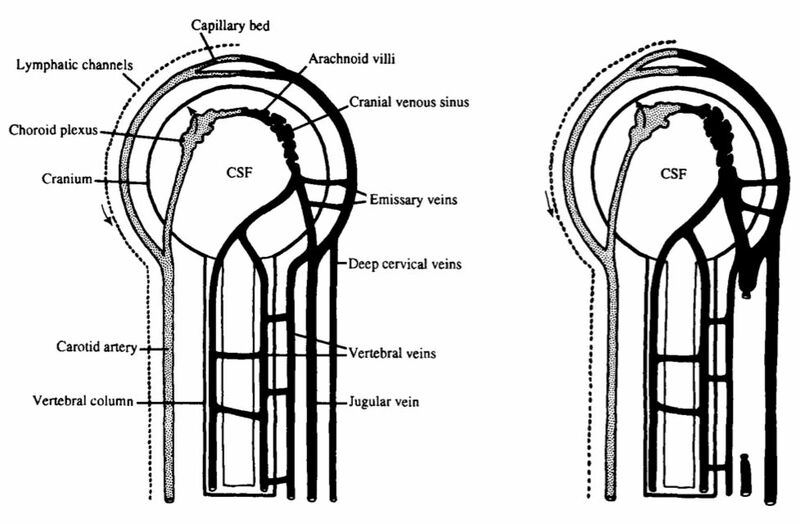 “CCSVI” was diagnosed by Combined Transcranial and Extracranial Venous Doppler Evaluation (CTEVD). 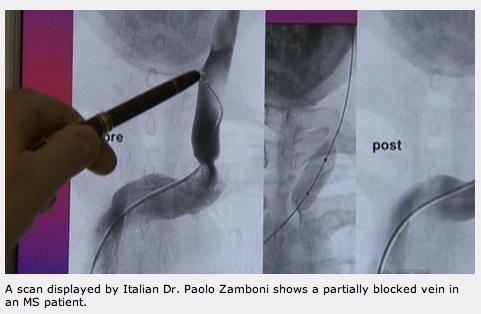 This technique has never been adequately described, published or validated by comparison with catheter hemodynamic measurements. 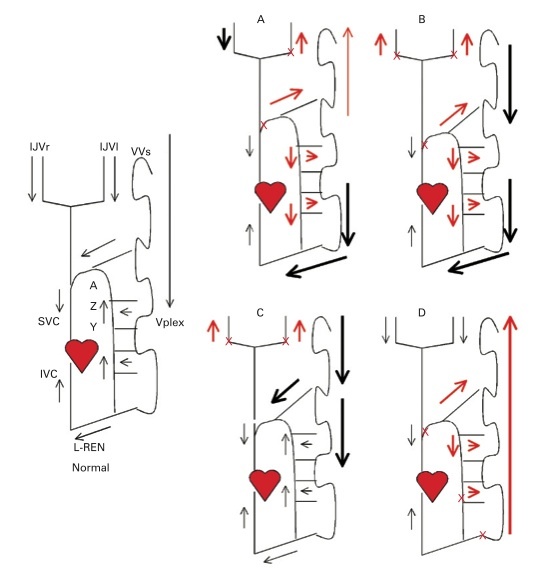 It seems that just about any venous flow pattern can be created by manoeuvring the subject in different positions and by using different phases of the respiratory cycle. 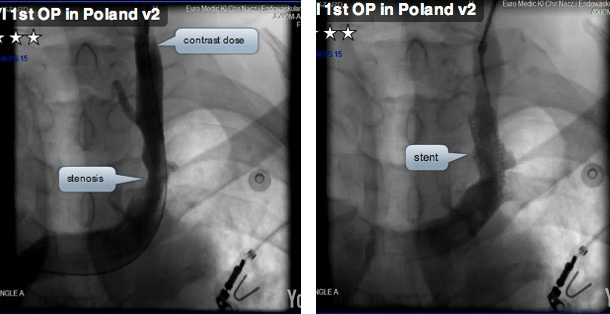 Certain of these flow patterns are then selected by unknown criteria and deemed to be “CCSVI”. Such selection is highly subjective which is why attention to blinding of the tester is extremely important. We have no details about how the tester was blinded. When one believes that one should find a certain result one is very attentive to even the slightest hint of the diagnosis. 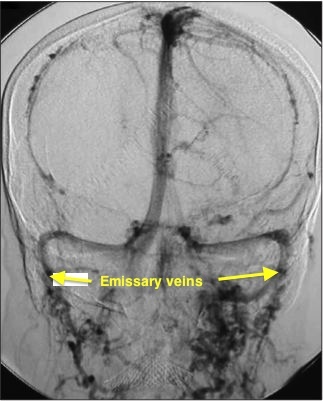 How “CCSVI”, however diagnosed, can lead to brain pathology without a substantial increase in jugular venous pressure has never been explained by Zamboni or Zivadinov. So, one can put no confidence in any numbers Zivadinov reported at his press conference. 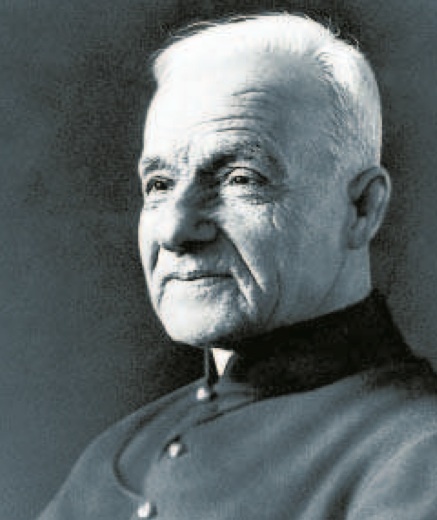 But if we are to take his results at face value they reveal the absurdity of “CCSVI”. He is claiming that 25% of the healthy population has “CCSVI” a condition declared by Zamboni to require immediate “liberation” by jugular vein stenting. Only 55% of MS patients have “CCSVI” but Zamboni had claimed 100% had it. There are two possibilities. Zivadinov is not using the same criteria for “CCSVI” as Zamboni or 45% of MS patients really don’t have MS. The latter is unlikely. So even two initiates in the occult art of “CCSVI” diagnosis can’t agree on the criteria. Then how will the rest of the world learn to diagnose “CCSVI” if it really exists? 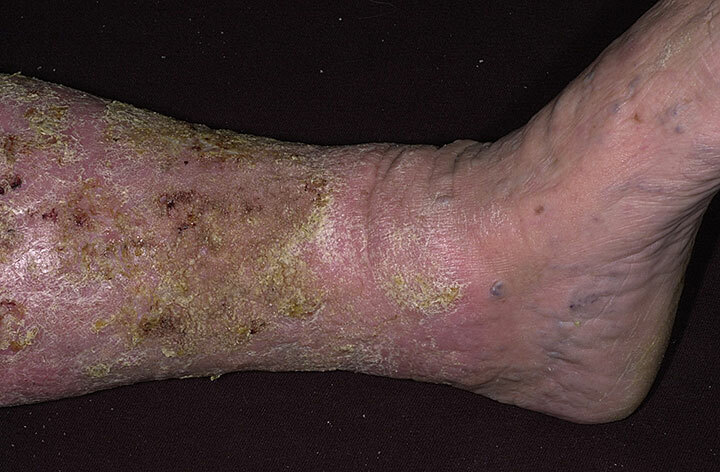 Take a hint, true believers, “CCSVI” is really just normal variation in venous anatomy, not a disease.